Every year soon after WWDC, I install the beta of the upcoming version of iOS on my devices and embark on an experiment: I try to use Apple's stock apps and services as much as possible for three months, then evaluate which ones have to be replaced with third-party alternatives after September. My reasoning for going through these repetitive stages on an annual basis is simple: to me, it's the only way to build the first-hand knowledge necessary for my iOS reviews. I also spent the past couple of years testing and switching back and forth between non-Apple hardware and services. I think every Apple-focused writer should try to expose themselves to different tech products to avoid the perilous traps of preconceptions. Plus, besides the research-driven nature of my experiments, I often preferred third-party offerings to Apple's as I felt like they provided me with something Apple was not delivering. Since the end of last year, however, I've been witnessing a gradual shift that made me realize my relationship with Apple's hardware and software has changed. I've progressively gotten deeper in the Apple ecosystem and I don't feel like I'm being underserved by some aspects of it anymore. Probably for the first time since I started MacStories nine years ago, I feel comfortable using Apple's services and hardware extensively not because I've given up on searching for third-party products, but because I've tried them all. And ultimately, none of them made me happier with my tech habits. It took me years of experiments (and a lot of money spent on gadgets and subscriptions) to notice how, for a variety of reasons, I found a healthy tech balance by consciously deciding to embrace the Apple ecosystem. 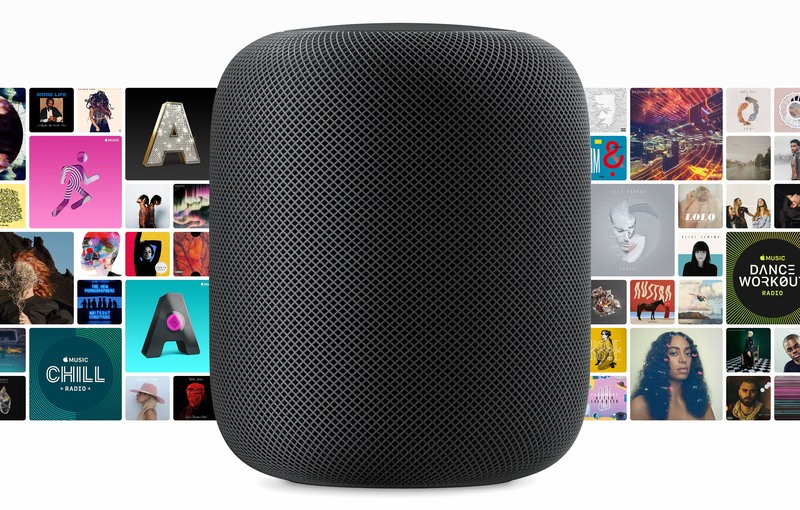 From its debut last June at WWDC to launch day this February, HomePod's primary purpose has been clear: it's an Apple Music accessory. 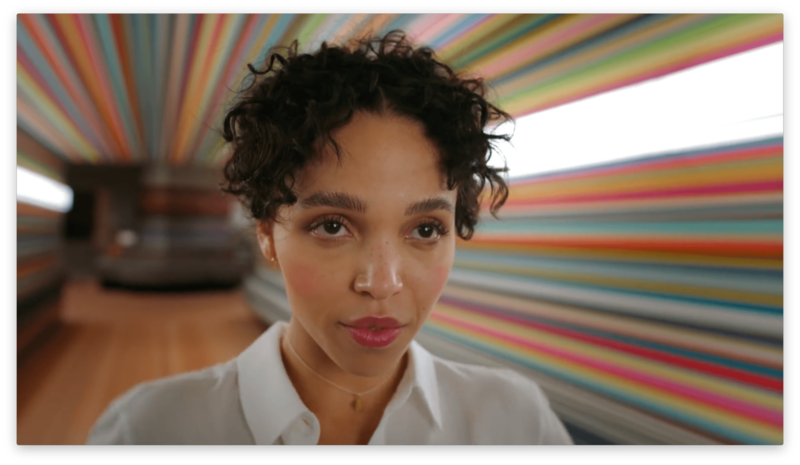 Music has been the sole focus of Apple's marketing, including the recent Spike Jonze short film – yet it's an angle many have trouble accepting. HomePod succeeds as a music speaker, but it's not the device we expected – at least not yet. Due to its arrival date more than three years after the birth of Alexa, we expected a smarter, more capable product. We expected the kind of product the HomePod should be: a smart speaker that's heavy on the smarts. Apple nailed certain aspects with its 1.0: the design, sound quality, and setup are all excellent. But that's not enough. HomePod isn't a bad product today, but it could become a great one. John Voorhees' HomePod ring; the device now sits on a coaster. 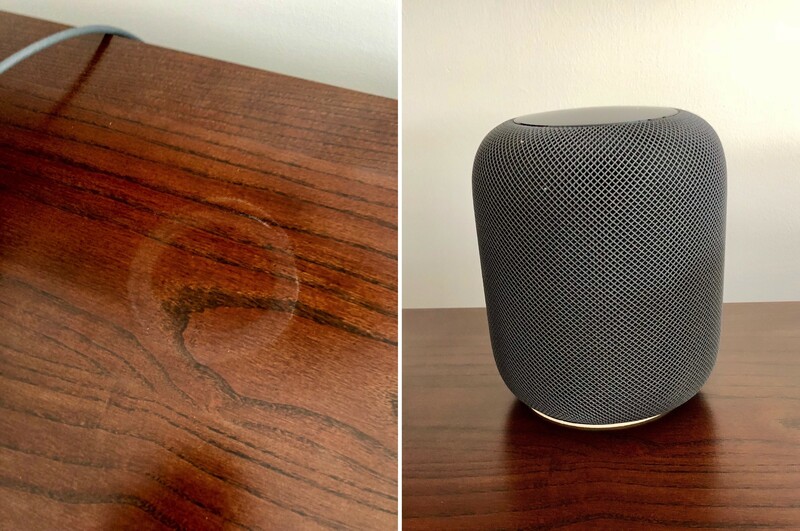 An unhappy discovery after we placed a HomePod on an oiled butcher-block countertop and later on a wooden side table was that it left a defined white ring in the surface. Other reviewers and owners (such as Pocket-lint, and folks on Twitter) have reported the same issue, which an Apple representative has confirmed. Apple says “the marks can improve over several days after the speaker is removed from the wood surface,” and if they don’t fade on their own, you can basically just go refinish the furniture—the exact advice Apple gave in an email to Wirecutter was to “try cleaning the surface with the manufacturer’s suggested oiling method.”...In other testing, we have seen no visible damage when using it on glass, granite countertop, nice MDF, polyurethane-sealed wood, and cheap IKEA bookcases. Not all whole-wood table finishes are alike: Certain wood oil treatments include drying agents that have organic compounds present in them — compounds that could potentially interact with the silicone in Apple's base. It appears that for those who will face this problem, it doesn't take more than a couple days for the white ring to become at least faintly visible. If you're not seeing anything after several days of HomePod use, it's likely that your furniture will be fine, but if you're concerned, using a coaster seems like the best low-budget fix at this point. 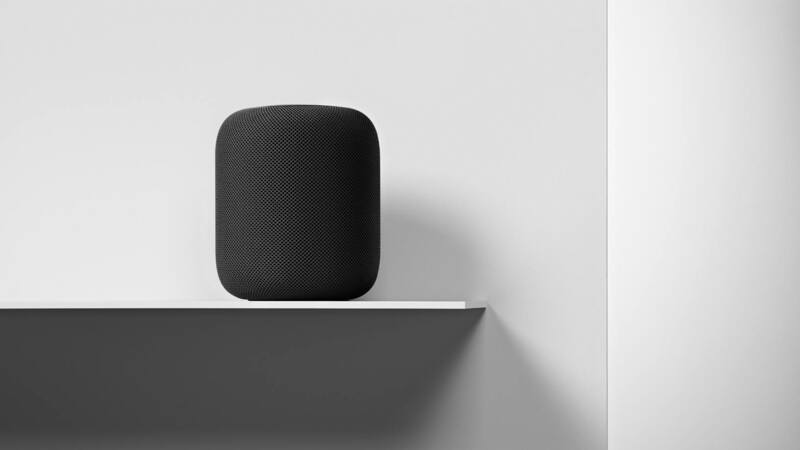 The new document also addresses the matter of cleaning HomePod – only with a dry cloth, or, if necessary, a slightly damp one – and informs users to keep HomePod away from liquids and heat sources. At the start, you should know two things about me: HomePod is the first smart speaker I've ever owned, and I'm all-in on the Apple ecosystem. These facts make me the HomePod's perfect customer, and they will surely color my comments. I'm guessing if I had more experience with other smart speakers, or I didn't own nearly every modern Apple product, my thoughts on HomePod would be different. That said, here are my early impressions. Judging from the comments to the post, WinterCharm isn’t the only audiophile excited about the HomePod and eager to try two as a stereo pair when that feature is released in a future software update. Loup Ventures, a US-based venture capital firm, ran a series of Siri tests on the HomePod to evaluate the assistant's capabilities on Apple's new speaker. After 782 queries, Siri understood 99% of questions but only answered 52% of them correctly – meaning, Siri on the HomePod failed to answer one out of two questions. I'd love to see a full data set of the questions asked by Loup Ventures, but, overall, it doesn't surprise me that the Google Assistant running on the Google Home speaker was the most accurate in every category. Adding domains will quickly improve Siri’s score. Some domains like navigation, calendar, email, and calling are simply not supported. These questions were met with, “I can’t ___ on HomePod.” Also, in any case that iPhone-based Siri would bring up Google search results, HomePod would reply, “I can’t get the answer to that on HomePod,” which forces you to use your phone or give up on the question altogether. Removing navigation, calling, email, and calendar-related queries from our question set yields a 67% correct response, a jump from overall of 52.3% correct. This means added support for these domains would bring HomePod performance above that of Alexa (64%) and Cortana (57%), though still shy of Google Home (81%). We know Siri has the ability to correctly answer a whole range of queries that HomePod cannot, evidenced by our note here. Apple’s limiting of HomePod’s domains should change over time, at which point we expect the speaker to be vastly more useful and integrated with your other Apple devices. Adding new supported domains would make Siri's intelligence comparable to Alexa (at least according to these tests), but Apple shouldn't strive for a honorable second place. Siri should be just as intelligent (if not more) than the Google Assistant on every platform. I wonder, though, if this can be achieved in the short term given Siri's fragmentation problems and limited third-party integrations. Initial orders of Apple’s new HomePod smart speaker will arrive on doorsteps and in Apple stores beginning Friday in the US, UK, and Australia. 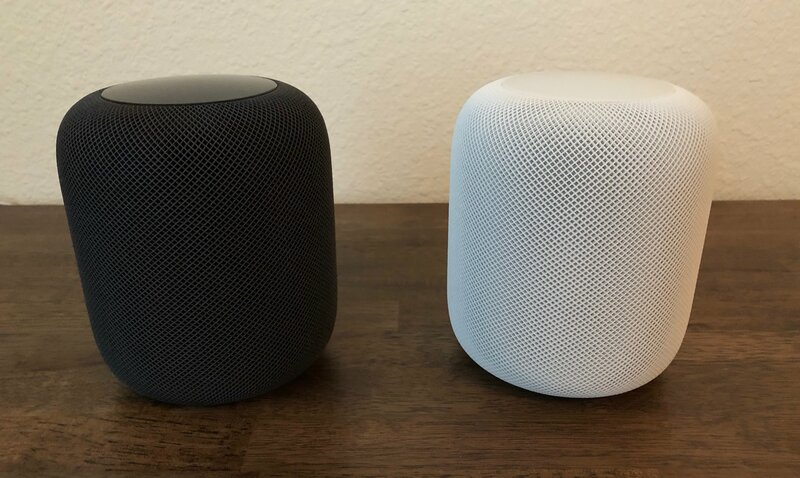 Today, reviews were published by several media outlets that have had about a week to test the HomePod. Apple also invited several journalists for a tour of its audio labs in Cupertino with Phil Schiller, hardware VP Kate Bergeron, and senior director of audio design and engineering Gary Greaves. The consensus of the first wave of reviews is that the HomePod sounds fantastic. Apple has brought its engineering expertise and computing power to bear in a way that reviewers say produces remarkable sound for the HomePod’s size and price. However, Siri’s limitations and the lack of support for third-party music streaming services also mean that the HomePod’s voice assistant features lag behind those of the Amazon Echo and Google Home. As a result, the HomePod’s appeal will likely be limited to people who already subscribe to Apple Music, use iOS devices, and care about high-quality audio. As a smart speaker, it offers best-in-class voice recognition, vastly outstripping the ability of other smart speakers to hear you trying to trigger a command at a distance or while music is playing, but its overall flexibility is limited by the limited command sets that the Siri protocol offers. Unfortunately, Apple’s audio engineering team wasn’t in charge of just putting out a speaker. It was in charge of the audio components of a smart speaker, one that simply isn’t as smart as its competitors. That’s really the crux of it: the HomePod sounds incredible, but not so world-bendingly amazing that you should switch away from Spotify, or accept Siri’s frustrating limitations as compared to Alexa. We know the HomePod works great with Apple Music, but for those who aren't Apple Music subscribers, what audio content can the HomePod still play for them – with Siri support, and without? Serenity Caldwell has put together a comprehensive guide for iMore that answers that question in exacting detail, filling in the gaps left by Apple's official marketing disclosures. For iTunes Match subscribers, it's good news.